Como resultado de su reciente reforma, "Relator 1" es una mezcla preciosa entre elementos históricos y diseño moderno. Ladrillos vistos, paredes enyesadas, baldosas rojas y vigas de madera en el techo armonizan perfectamente con un mobiliario contemporáneo. Este apartamento de 55 m2 dispone de un cómodo dormitorio con cama doble, armario empotrado y escritorio. Es muy tranquilo, ya que su ventana da a un patio interior. Sala de estar espaciosa con dos grandes ventanales, equipada con sofá, mesa de comedor y cocina americana. Cuarto de baño completo con plato de ducha. El edificio está compuesto por dos apartamentos vacacionales, uno por planta. Ubicación céntrica junto a la Alameda de Hércules, donde encontrará una gran variedad de bares, restaurantes y pubs, y a tan solo 20 minutos andando de la Catedral. Nota: Lavadora compartida en el hall del edificio para clientes alojados en los apartamentos Relator. Macarena es un barrio tradicional lleno de actividad local y colorido, situado al norte del casco antiguo de Sevilla. 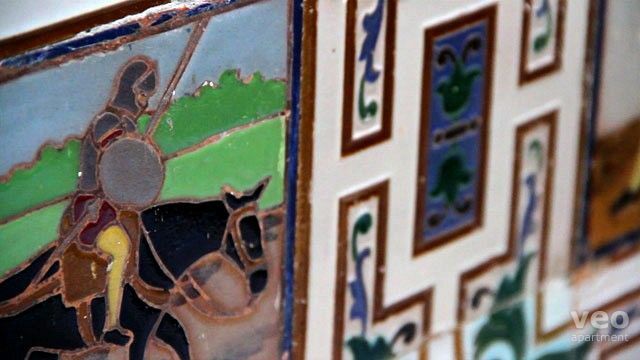 Parcialmente delimitado por las antiguas murallas de defensa de la ciudad, Macarena es un barrio marcado por el carácter dinámico y trabajador de sus residentes. En la emblemática calle Feria se encuentra su conocido mercado de abastos y su mercadillo de "El Jueves", donde se vende una gran variedad de antigüedades y objetos de segunda mano. Dirigiéndose al oeste, llegará en seguida a la Alameda de Hércules, una amplia plaza recién remodelada rodeada de bares de tapas, restaurantes, cafeterías y pubs. En dirección norte encontrará el Arco de la Macarena, la antigua muralla de defensa y la Basílica de la Macarena, sede de una de las hermandades de Semana Santa de Sevilla más renombrada. Macarena Murallas, basílica de la Macarena, mercadillo El Jueves y Alameda de Hércules. 16:00 - 24:00h. Si van a entrar antes o después de la hora establecida, solicítenlo con antelación. 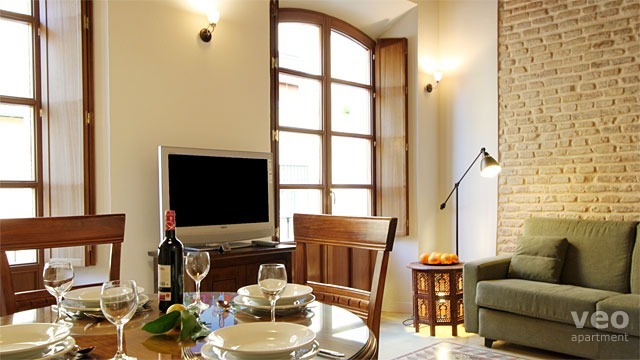 "Everything you need for a comfortable and fun stay in Seville"
Great apartment for long or short stays in a part of town where there's something on offer whatever your age or interests. Helpful Veoapartment staff always available if needed. 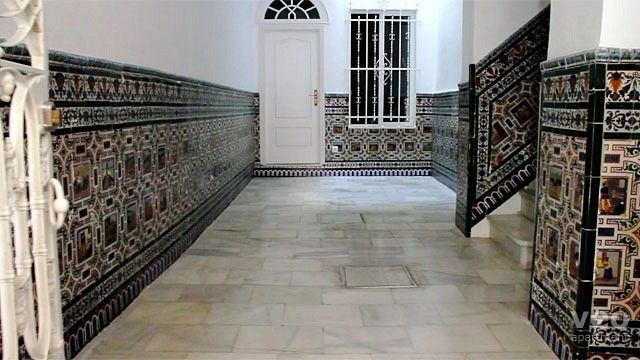 Das Apartment liegt in einem sehr authentischen Viertel von Sevilla, mit viel Flair. Einzige Einschränkung: für den der es eher ruhig in der Nacht mag, sollte sich sicherlich eine andere Gegend aussuchen. "Perfecto en ubicación y comodidad"
Muy céntrico, Con mucho gusto decorado, con todo lo necesario. "Comfortable apartment in a quiet street yet in a lively and charming area." 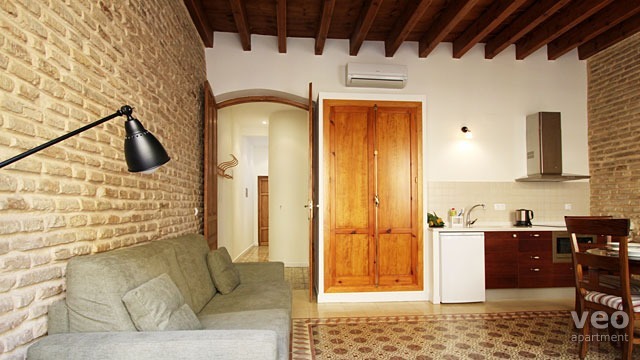 Veoapartment make organising a stay in Seville easy, affordable and problem free. "Very comfortable well equiped spacious apartment in a good location"
Second time we stayed in Relator apartments. Because we were two couples we rented both apartments (one above the other) the location is great about 20 mins walk to the cathedral but next door to the almeda de hercules . On Calle Feria there is a weekly flea market and some great tapas bars , especially in the fish,meat and produce market on Feria. The apartments have everything we needed for a great 2 weeks stay. "Perfect located towards the city cernter, warmly decorated and well-equiped apartment for 2 persons." Very good! Service of the team was 100%! Everything was well explained, also touristic information was provided. Because the office is nearby, it is very convenient in case something would happen or things are needed. Location in Macarena is nice, very relaxed area full of nice shops and (tapas) bars. "Excellent location and nice apartment"
The apartment was clean and tidy. Air conditioning worked well, I loved the terrace in the early morning and at night. The staff are fantastic and always makes me feel welcome. Thank you guys for making my stay complete. 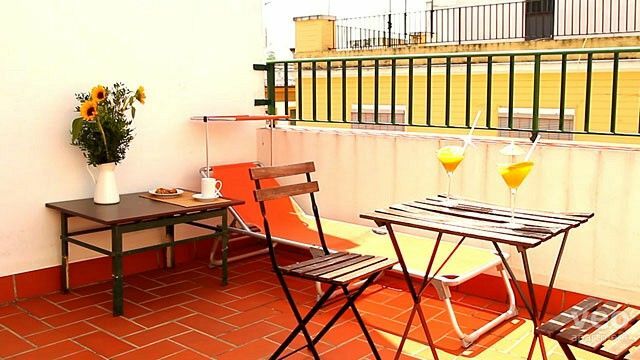 "Very comfortable apartment in possibly the best area of seville"
The apartment was very clean, spacious, very well located in the Feria district for excelent spanish bars and coffee sellers. The bed was very comfortable and being at the back of the apartment a little bit away from the normal noise at night. Kitchen had everything we needed to cook our evening meal and user friendly. Apartment was bright and the tv had lots of channels we found the discovery channel in English which added to our enjoyment. Nice touch was the washing machine, The bathroom was good and the shower spacious.All in all an excelent apartment and very nicely decorated with original floor tiles. Nice apartment, all facilities are present. Location is nice. In the immediate area are plenty of attractive spots, shops, bars etc. My husband and I stayed in four cities during our 2-week trip to Spain, and this apartment in Sevilla was our favorite. There is LOTS of space, with great stone and tile accents, really great closets, and a comfortable bed. Very quiet at night. The shower was good in terms of hot water and water pressure. The location was really convenient for catching the city bus, etc. The office employees are very friendly and helpful. After we checked out, I realized that I had left a couple of jackets in the apartment, and the staff were very helpful in arranging to mail them to me. We ended up not using the breakfast tickets, so I can't comment on that. 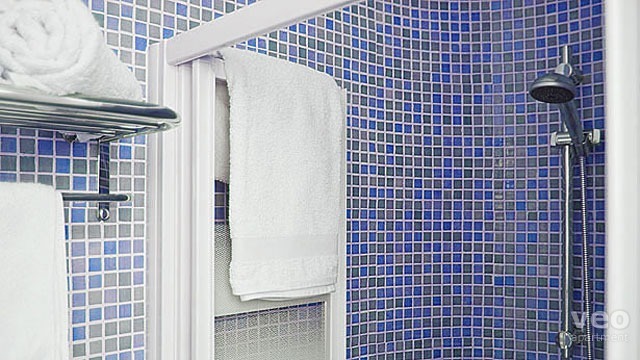 The only suggestions I would have: maybe add a soap/shampoo holder to the shower (I think there are some that could attach to the pole) and check the lights before new guests come; we noticed a couple of lightbulbs that were out. Also, it might be good to have written check-out information in the apartment; we had to call to ask about that. All in all, this was a really lovely place to stay, and I highly recommend it. 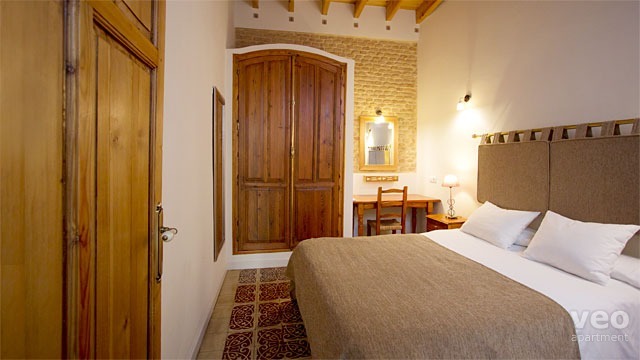 Apartment is quite centrally located, especially if you are booking for Semana Santa. We were there for Feria, which also worked great. Excellent area, great apartment, very comfortable and secure. Host is excellent. 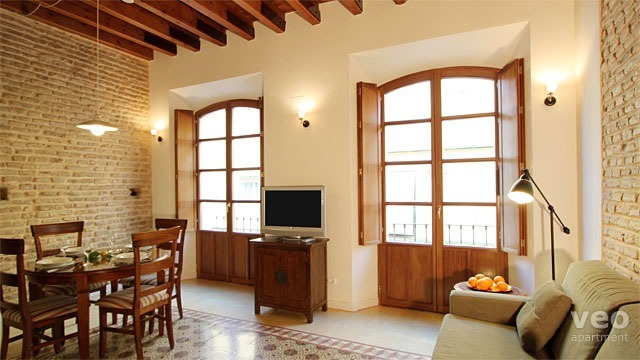 This apartment was perfectly situated for our first discovery of Seville. The neighbourhood is complete with a public market, shops, bars, restaurants, steps from the Alameda De Hercules outdoor plaza, and a ten minute walk to the centre. 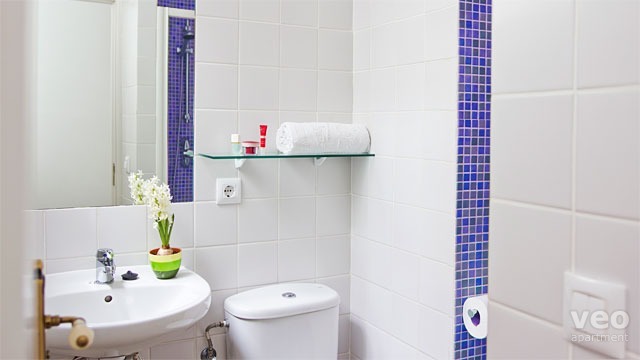 The apartment is large, beautifully but simply decorated,very clean and comfortable. Marcus, the host, gave us a tour of the area when we arrived. He was very helpful, even posted a parcel for us after we left. We strongly recommend this company and this property. "Perfect apartment for a sportive stay"
We stayed there for a rowing training camp. The apartment is well equipped: good beds, spacious, good kitchen, good ac, washing machine and roof terrace. Just what we needed. This apartment is perfect, is in the down town area, close to all historical objectives, main shopping street and, of course, in the heart of party area. "A very convenient and pleasant apartment"
We loved the apartment and its location. The apartment is well equipped, and has a very nice atmosphere. The only thing I missed was an extra set of pillows on the bed and I couldn't find the scissors. We also really enjoyed the breakfast facility! Lovely local cafe, fantastic coffee and toast and very nice service! "Spacious apartment ideally situated for restaurants bars and public transport"
people lived and worked. Whilst still close enough to visit all the major attractions it was an area which was nobviously busy and full of normal life. Great apartment, great location (in the non-touristy heart of Seville city, but a close walk to sights) Really well decorated and full of character. Only drawback is it could use a toaster or an oven for a longer term stay. Can't wait to return! 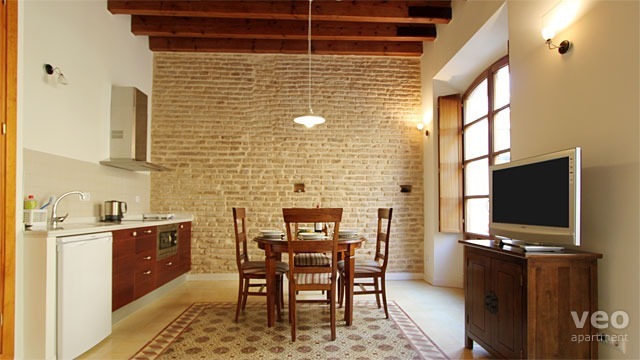 "Smart apartment in a great area"
This apartment is comfortable and very tastefully refurbished. The bed is good and almost everything in the flat is of a high standard, looked after with care. The location is in Macarena, in many ways the best place to be as it's real Seville, poor but vibrant. There's a great food market just around the corner. Unfortunately we could not use the sofa bed as a sofa as once down it was not possible to re-fold it. If Veo offers a sofa-bed, it needs to make sure it can be used as such. This was a real disadvantage so make sure they've fixed it before you book. The sound insulation also needs looking at as the street-facing living room is noisy. It makes sleeping in the living room on the sofa bed almost impossible without ear-plugs. The main bedroom is much quieter, though when the washing machine downstairs is on, the noise reverates around the building and certainly disturbs any siesta you were hoping to enjoy. Kitchen is adequate - why no bread knife? - with good standard pans. Speakers for an iPod and a TV able to access British programmes or films would have been nice. The people running the agency are very friendly and helpful - though they didn't sort out the sofa-bed problem. Overall, though, efficient and interested service - the woman doing the cleaning was exceptionally kind. So I recommend this apartment for one or two sharing the main bedroom but not if there are more of you and you want to use the living room as a bedroom. Propre et fonctionnel. Confort simple, mais appartement propre et agréable. "Fantastic house, great pleasure, great people !!!!!!" Apartamento muy agradable, buena calidad de materiales,bonito, con todo lo necesario y en un barrio de Sevilla céntrico y dinámico con muchos bares, tiendas de pequeños propietarios, artesanía. Cerca de la oficina donde se entrega las llaves con gente trabajando a cualquier hora e incluso en domingo y fiestas con alegría y simpatía y en muchos idiomas.¡bravo Marcus, Joao, continuad así! "Schöne Unterkunft für eine schöne Woche"
We loved our 6 nights in this apartment, it looked exactly like the pictures, very clean and well maintained. The location was perfect, just a couple of blocks from the Alameda de Hercules which had so many fantastic tapas restaurants and bars. The apartment was a comfortable 20 minutes walk to the Cathedral and Alcazar with lots to see along the way. We were met promptly at the apartment when checking in and everything was thoroughly explained. The office was conveniently located a short walk away for any deficiencies. The only thing that we didn't enjoy was the hard bed but it was very quiet and the air conditioning worked well. "Nice apartment in great neighborhood"
The apartment was very clean & nicely remodeled with great amenities like laundry & AC. In a lively neighborhood that gave our visit a very local feel. Close to rental office in case we needed any assistance. The restaurants nearby in the Alameda de Hercules were excellent & at night was packed full of locals which made for great evening strolls. The city center was only 20 minutes away so it was no problem visiting the historic sites. We would definitely stay there again. "Large, clean 1 bedroom apartment in Macarena neighbourhood"
Spacious one bedroom apartment with plenty of room for two and also has a sofa bed in the living area along with a built in wardrobe so good option for up to 4. Good size living area with TV, sofa, round meals table and kitchenette with fridge, convection oven and hotplates. Kitchen had everything we needed for our short stay. There was no toaster, but convection oven has a grill setting. Shared washing machine with other apartment (not quite as convenient as having one in the apartment). Good to have outside drying lines on roof terrace, so clothes dry quickly. Good exercise getting from the washing machine on the ground floor up to the lines on the third floor. Also shared iron and board. Small bathroom with a good size shower (no bath.) Good hot water, stable temperature. Good size bedroom. My wife found the bed and pillow a bit to firm but I thought it was fine. Excellent Wi-Fi access. Supermarkets and fruit and veg stores nearby. Noisy with pedestrian and traffic noise (as per city location) but windows are double glazed and bedroom is at rear of apartment and fairly quiet especially with internal doors closed, except for on the Saturday night when there was rowdy pedestrian noise until 5am. Front room windows do not have net curtaining so if the shutters are open you are visible to the apartment across the road so need to be dressed. Windows in hall, and bathroom do not have curtaining which allows extraneous light into the apartment from the apartment above (via light well). This can be a problem at night but is remedied by closing bedroom door. It is about a 25 minute walk to the Cathedral and Alcazar but Seville is flat so it is not strenuous. Markus was very helpful and can recommend some good places to eat nearby. He organised a taxi for us as we were leaving early on Sunday morning. The office is only a couple of minutes walk away. Price included a breakfast of coffee and toastada at a nearby café to start the day. 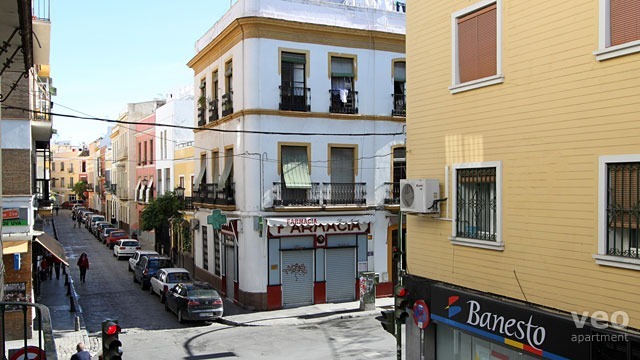 Overall this is a clean spacious apartment in the Macarena district of Seville, which offers good value for money. The street noise was a bit of an issue but I think that will always be the case for an inner city apartment. A great place to experience life in the real Seville. Veoapartments were easy to deal with. Key collection etc was easy. Photos show the apartment as it is. aucun point négatif pour cet appartement, que du positif! Quartier agréable et vivant, commerce tout près de l'appartement. Très bonne accueil! Well located near to lots of restaurants, bars and key sights. The apartment was very well fitted out and we very much enjoyed our stay. The apartment had everything we'd hoped for in terms of facilities, location and easy walking access to the sights in Seville that we wanted to see. The kitchen is well equipped, the king-size bed very comfortable, and the retention of original features throughout gives the apartment a very pleasant and relaxed feel. A place you are very happy to return to at the end of a day's sight-seeing. Nos quedamos muy contentos con el apartamento: brillante, con todo lo necesario para cocinar en un barrio animado con cuidado y no demasiado turística. ¡volveremos! Le site est déjà très bien fait. On apprécie la carte avec la situation des appartements. "Wunderschönes Appartment in einem tollen Viertel und die Organisation ist auch super!!" Das Appartment ist sehr stilvoll renoviert, mit schönen Fliesen, geschmackvoller Einrichtung und liegt, wie wir begeistert festgestellt haben, in einem sehr schönen Viertel. Sehr lebendig, eine grosse Markthalle ganz in der Nähe und die historische Innenstadt ist leicht zu Fuss zu erreichen. Uns hat es auch sehr gut gefallen, morgens das Frühstück in dieser quirligen, spanischen Bar einnehmen zu können. Es war unser erster Aufenthalt in Sevilla und wir werden sehr gerne wieder bei Veoapartment buchen. "Lovely apartment in Macarena district"
Wir waren sehr zufrieden mit dem Appartment und vor allem mit dem Service von veoapartment vor Ort. My wife and I stayed in this clean, charming apartment for three nights in March, 2012. 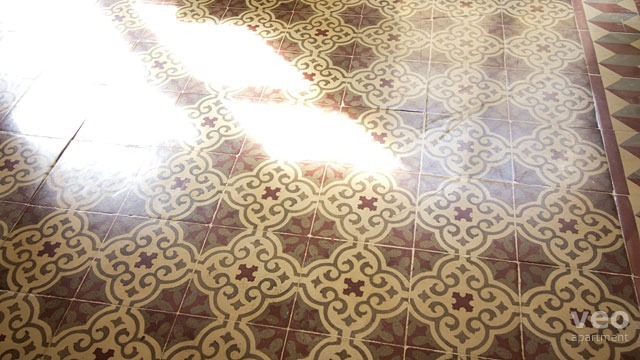 It's beautifully designed and decorated, has a lovely bathroom and bedroom, and is paved by beautiful floor tiles. The apartment is about a 20-minute walk from the Sevilla's main tourist area, and often we enjoyed the walk as much as the sights. The walk takes you through Sevilla's main local retail area, which is packed with local Spaniards shopping and hanging out in cafes. The neighborhood of the apartment seemed very safe, and it was quiet as could be the nights we stayed there, except for some pleasant guitar music down an alley one night. Highly recommended.